Officials at Auschwitz have criticised a US congressman for making and voicing a video inside a gas chamber at the former Nazi death camp. The memorial and museum tweeted that the gas chamber was "not a stage" but was a place for mournful silence. 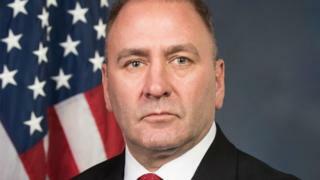 Republican Clay Higgins said in the video that the horrors of the WW2 death camps were the reason why the US military should be "invincible". Some 1.1 million people, mainly Jews, died at the Nazi-occupied Poland camp. Mr Higgins made a five-minute video showing him in different parts of the museum talking about the atrocities in the death camp. At one point, he goes inside a gas chamber and explains how the victims were gassed. "This is why Homeland Security must be squared away, why our military must be invincible," he says. But the museum responded that it was inappropriate to speak inside the gas chambers. "Everyone has the right to personal reflections. However, inside a former gas chamber, there should be mournful silence. It's not a stage," it tweeted on Tuesday. Later it posted a picture of the entrance to the building showing a plaque asking for silence. The Louisiana congressman has not yet responded to the criticism. His offices were closed for the Fourth of July holiday. However, the video was not being displayed on his website and social media users suggested it had been removed. The Anti-Defamation League, an American-Jewish anti-discrimination organisation, said the video was "incredibly disrespectful to the hallowed ground" of the memorial and museum. Some Twitter users reacted with fury.